In my experience academics writing about education are rarely extremists, they are usually thoughtful and careful about their conclusions and tend to walk the centre line. Hirsch, despite the hype, is no exception. To be honest I found this part of his book unconvincing and a bit off-putting, I’m not keen on polemics and I don’t like being told what to think, especially if I detect the author is trying to claim special abilities because of his expert knowledge, “My academic specialties thus freed me to think in new ways about what has gone wrong in our schools” (p.6). I find this sort of thing the intellectual equivalent of, “Trust me, I’m a doctor” and it always has the opposite effect on me. For these reasons I’m going to skip over the first chapter and only concentrate on those parts of the book that are worth considering from a teaching perspective. Before I start it is worth pointing out a couple of things. The first is that the book is mainly about the teaching of literacy in Primary education. It does have some application for Secondary, but the examples that illustrate Hirsch’s argument are all from the teaching of young children. The second is that Hirsch, in common with many academics who don’t teach, is strong on ideas (although not all his ideas are strong), but weak on practice. Sometimes the teaching activities he recommends sound naive, even quaint – such as young children pretending to be radio announcers to practice their standard English – and is not at all clear if he has much, or even any, recent and relevant teaching experience at Primary age. Which is a shame, because this knowledge deficit (see what I did there?) seriously weakens his argument. Although it takes a while for Hirsch to get there (page 64) the really important teaching idea in “The Knowledge Deficit” is Steven Pinker’s assertion that the human mind learns spoken language and written language in different ways. The argument is that the human brain has evolved to make meaning of spoken language without the need for explicit instruction – children learn new vocabulary and knowledge in familiar contexts indirectly through tacit experience – but has not evolved to understand written language in the same way – the rules, codes and conventions of written language have to be taught more directly. This idea sounds plausible and scores highly both on my own experience of what works in the classroom and on future utility. I followed up the Pinker reference and read more about his theory on his website and I’ve ordered, “The Language Instinct” which will hopefully arrive in the next few days. His argument that human language has been around for hundreds of thousands of years, so humans have evolved innate language learning abilities, sounds convincing. As does, the reason we haven’t evolved the same innate abilities in reading and writing is because it is a much more recent invention, 5,000 – 6,000 years. Learning the skills of decoding and encoding for reading and writing require explicit instruction and extended practice using short focused activities. Whereas, learning new knowledge and developing understanding requires implicit instruction in familiar contexts, over time, with students being active participants in the process of making meaning. This is both a reassuring and useful conclusion because it matches very closely what I’m already doing in the classroom, while also giving me a new way to understand why this approach works and how to refine and make it better. Pedagogically it makes sense and explains why children should experience a range of different activities during the school day, which will help them over time to develop different kinds of knowledge, skills and understanding. I would be interested in developing a curriculum timetable that would create an effective and manageable teaching and learning structure based on these ideas. The next ‘big’ idea in ‘The Knowledge Deficit’ is more about curriculum design. Those children without knowledge of all three will be at a major disadvantage. I like this idea of the ‘situation model’. Hirsch is making an important point that reading comprehension is not the same as decoding and that children, even the ones who learn to decode well, can not necessarily read well unless they have knowledge of the subject. This is an argument against ‘content light’ reading schemes and school curriculum where children spend their time learning formal skills without developing knowledge about the world. I’m in full agreement with this. It has been my experience that very young children even from nursery age are fully able to start learning information from different domains of knowledge; history, science, geography etc. (in ways that are meaningful and engaging to them) and that we do a great disservice to them if we waste their time on nonsense. Time is a precious commodity in schools and we should be using every moment as an opportunity to develop children’s knowledge and skills. Further, Hirsch is very aware of the importance of spoken literacy in the development of domain knowledge and knowledge of the standard-code. Speaking and listening are a vital part of Hirsch’s curriculum and should, in his opinion, constitute a substantial part of the school day. He says children understand much more than they can read and although they should spend an appropriate amount of time reading and writing every day, the rest of the time should be used developing their knowledge and skills through activities that utilise speaking and listening. Although Hirsch stresses the importance of ‘persistent explicit instruction’ he is clear this should not be a tedious exercise in rote learning. I can’t think of single primary school I have been to in the last ten years, and I’ve been to a lot, that has not been using phonics regularly and systematically as part of the way they teach reading and writing. This is not a new idea or one that has had trouble being adopted. In fact I remember the first school I worked in back in the early 90s, a school that placed a very high premium on creativity and was led by a headteacher immersed in ‘progressive’ education (she had a copy of the Plowden Report on her book shelf, next to a photo of A.S. Neill) that introduced phonics to the children from their first week in Reception. The truth is phonics work for most children, most of the time, but not for all and, as Hirsch points out, being able to decode is not the same as being able to read. Let’s keep this all in perspective, phonics are not a silver bullet. Apparently the teaching of knowledge explicitly has, for some, become a very bad thing. I’ve never actually met one of these people, but according to Hirsch and others, they have had a malicious stranglehold on US and UK education since the late 1960s. To be honest I don’t care much for this theory, nevertheless Hirsch has a point when he says knowing stuff is important. A good early start in verbal knowledge and world knowledge important. Young children can understand much more than they can read and we must, therefore, spend large amounts of time reading aloud and discussing challenging material with children. I really have no problem with the idea that children should be taught challenging, rich and useful knowledge from a range of domains using different teaching techniques from a young age. This just does not sound controversial to me. However, the idea that there is a core of shared knowledge, which we can all agree on and keep free of dispute I’m not so sure about. The National Curriculum is the closest we have and the last review hardly seemed to be entirely free of ideological or political interference or go by without a hint of controversy. As well as a being familiar with a core of common knowledge, Hirsch also stresses the importance of children developing an understanding of the different codes and conventions of formal language and writing. Children need to learn the difference between the elaborate code of ‘school speech’ (formal language) and the more familiar restricted code of ‘home speech’. School speech uses standard English and makes it clear that different forms of language are used in different places. Children need to learn when and where to use different language forms. Further, these differences are transferred to writing, which uses a form of print code that relies on a shared body of background knowledge, vocabulary and understanding of an elaborate system of conventions. For teachers interested in drama, the words code and convention have a special resonance and when Hirsch mentions them it is difficult not to be immediately reminded of the work of Dorothy Heathcote. Heathcote’s work, through drama for learning, focused on the use of sign and significance in social situations and her essay on sign, “Signs and Portents” in “Collected Writings on Education and Drama” is one of the seminal works in drama and theatre. Heathcote maintained that conventions are socially agreed constructs that people use to make meaning. They have to be used and applied in multiple contexts, that become more sophisticated over time. It seems unlikely that Hirsch is familiar with Heathcote, he certainly does not mention her in his book, however, teachers interested in the use and developments of conventions in drama and writing might want to search her out. Her use of framing, a theory she borrowed from Goffman, does sound very similar to Hirsch’s use of language and behaviour in different social situations. 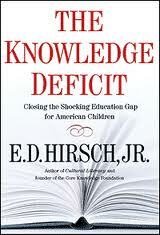 I haven’t read Hirsch and so this was really interesting. However, regarding the ‘unprovable bunk’. I don’t know if you have any knowledge of history textbooks over the last 20-30 years. Maybe you don’t but take it from me they have changed dramatically over my career. Current A level texts look like GCSE texts from when I started teaching and the books I used at school at GCSE are actually more detailed than some of the current A Level texts. It isn’t just content, language has been simplified also. Interestingly these ‘content light’ texts ask very big questions about causation or interpretation. There is a focus on skills but the content needed to genuinely tackle these questions has been reduced with the assumption that the ‘skill’ can be mastered and transferred when genuine skill requires grasp and marshalling a broad range of info. . In the last CPD I went on for History HoDs I was advised that there was a hierarchy in acquisition of ‘skills’ such as causation or interpretation. When I pointed put that the difficulty actually lay in the complexity of the material the well known course leader actually looked like he had never considered that before but acknowledge there was something in it! I wrote a long comment here on this issue: http://teachingbattleground.wordpress.com/2013/07/02/the-history-teachers-we-dont-hear-from/ that is very relevant if you are interested. I’ll take your word for it, I know you have very strong views on the matter. I’m really talking from my own experience as a primary school teacher. On reflection I’m going to take it out, it’s a silly remark really and unnecessary. You seem to have changed the wording so that specific examples can no longer disprove your point but my history textbook example is not isolated or unusual. The examples I give in my link affect all GCSE’s and A Levels and the changes only happened when exams were last reformed, with the explicit intention of prioritising skills. The NC levels that are only just changing have the same assumptions that the skills have innate difficulty without reference to the knowledge brought to bear. Just look at the current NC and levels for KS3 science, the sidelining of the knowledge is breathtaking in the assessment. The fact that there is knowledge still taught in schools has no real bearing on the debate. It is the unhelpful de-coupling of skills from knowledge in assessment or textbooks in which knowledge is often neither adequate to address the question or as extensive as it once was. I could find examples ad infinitum which makes me endlessly bemused when the issue is denied. I took it out because it wasn’t necessary to my argument. As a rule I don’t comment on subjects I have no knowledge of and so have nothing to say about your examples. I work in primary education and from my experience there has been no dumbing down of the curriculum during the twenty years I have been teaching, quite the opposite. In order to maximise anyone’s reading ability you need to maximise their ability in phonics. When Hirsch says decoding is not the same as reading it is because he understands that reading is a function of decoding AND aural language comprehension not because there is some other way to read for some children. To enable children to read well you must teach (all) children to decode as well and as fluently as possible AND provide a language rich environment (which Hirsch’s curriculum does very well). Synthetic Phonics has repeatedly been shown to be by far the most effective way to teach reading for all demographics for a simple reason; it explicitly teaches exactly how English writing and reading works. Schools with well trained and informed teachers who teach SP knowledgeably teach reading within a language rich environment. In fact, because teaching reading with SP is so fast, efficient and effective it enables much more time to be spent on other learning and, as most children will progress very quickly to a point where they need relatively little teacher guidance, the teacher can concentrate efforts on those who need it most. Of course some children WILL struggle but 1) the proportion failing to reach functional literacy will be tiny compared to the “long tail of underachievement” characteristic of ‘Mixed Methods’ teaching, and crucially 2) those children will have benefited from synthetic phonics teaching, not harmed. I can think of some who think they are teaching phonics when they are in fact teaching mixed methods or the ones that teach phonics (reasonably well) and then send home ORT look & say reading scheme books. As a primary teacher you are familiar with national curriculum levels in history. The same issues apply to the lower levels as to the higher and geography levels have the same problems. In science the first set of level descriptors about scientific method have the same problems. If you only feel able to draw on your individual experience then surely you cannot comment more generally on Hirsch’s work which you appear to do. 1. I’m not going to comment on things I know nothing about even if you find that annoying. 2. I disagree with you about the teaching of knowledge in primary schools. 3. I’ve been careful not to comment on those parts of Hirsch’s work that I have no knowledge of, like his examples from American schools. OK I won’t post after this but I thought you would be familiar with national curriculum levels for history geography and science at KS2. My last comment was a genuine attempt to bring the debate on the decoupling of skills from knowledge onto your own turf. I don’t know if ‘teaching knowledge explicitly’ is a direct quote but I’m not sure it is helpful to describe the faultline in this debate. It seems clear that Hirsch does not think enough knowledge is taught in primary schools because his own ‘core knowledge curriculum’ contains much more ‘stuff’ than is taught in most primaries today. I also don’t think it would surprise Hirsch that you have not noticed a decline in amount over the last 20 years. From what I have read the change in approach began much earlier in primaries. It is clear you think that the amount of knowledge taught in primaries is adequate to provide cultural literacy but also clear that Hirsch disagrees. I agree with Marion and have read the most recent report on the phonics check and it seemed to reach the conclusion that a majority of teachers surveyed didn’t underrstand what phonics teaching was. I’m sorry if I’ve given you the impression I’m not open to debate, I’ve actually been very busy. I’m happy to debate subjects I know something about and am very familiar with both Curriculum 2000 and the new Curriculum. When I say I have not noticed a decline in the teaching of knowledge in primary schools in the last twenty years I’m being genuine. However, this is not the same as saying I agree that there is enough teaching of knowledge, that is a separate argument. In fact, I don’t think there is enough content knowledge in the Primary Curriculum *and* I think Topic is not a very effective way to organise and teach domain knowledge, which requires a much more focused method. Although I’m sure Hirsch and I would disagree on many things, I think the importance of teaching a curriculum rich in subject knowledge is something we would have in common. The real question is: what knowledge constitutes the core? That is something we can all disagree on. I think “Topic” can be a very effective vehicle to teach knowledge if done well. The problem is when teachers make tenuous links in an attempt to cover every subject within the umbrella of the topic. Some things need to be taught discretely, but when you think about history it is often linked to social, economic or geographical issues. I agree, when done well. And the ‘tenuous links’ problem is the issue. I’m thinking of writing some more on this in a future blog, not enough space here to expand my argument. I think that good teachers will naturally exploit any knowledge area they are currently teaching if it lends itself to application in other areas. So for example, at a very simplistic level, if we are learning about Romans in history we might use Roman themed problem solving in maths, consider a Roman site in Geography and so on, but only if it suits and if you don’t think they’re going to get sick to death of the bleeping Romans. Unfortunately I suspect (and have oft seen) that when using an overtly ‘Topic’ approach the cart goes before the horse and what is taught can be content-light, theme-heavy and sometimes chosen not because it is considered to be the most important thing the pupils need to learn but because someone has done all the leg-work (important for time-deprived teachers) and produced an off-the-shelf (or download from the internet) package. I see the same problem with technology in the classroom. Often it is “wow, what a great application/game, how can I build a lesson around this” rather than “I need to teach my pupils ‘x’, what is the best most effective way to achieve this” And if a great app/game happens to support this then fantastic but it shouldn’t be the start point. I agree Monique there are some inherent problems in Topic, tenuous links, activities just for the sake of them or they fit into a preconceived plan, and a tendencies sometimes to focus on skills rather than content. Nevertheless, Hirsch’s point about ‘implicit’ learning, which I take to mean learning developed through a knowledge rich context is a compelling one. Topic is just not the solution.